She’s a Whirlwind – Living life the MegaSpecial way! Just gotta totes love my amazing friend & pilates instructor, Hannah Bailey. Did I mention she’s my ‘Fight Klub’ instructor too! 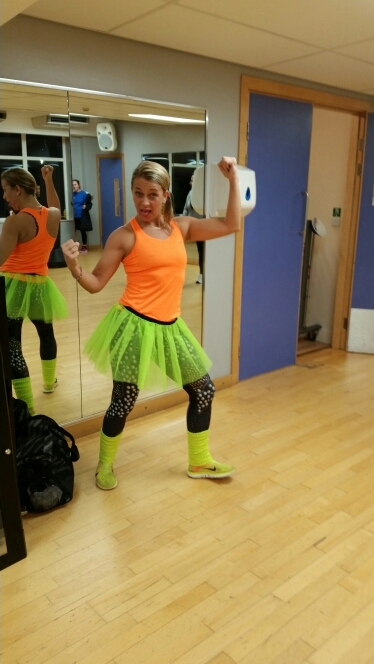 Photo took last night as she arrived for Fight Klub after she’d just taught ‘Clubbercise’ What a combo! Then after class, she’s the wonderful Hannah! Somewhere in all that madness she’s also a Specialist in pregnancy and sports massage! You just can’t imagine it can u! 5 years ago I would never have thought that I would be living this life with these friends and loving it! I always loved different sports and activities but then MS and life stopped that! MS will not stop me living my life any longer! Even if it means changing what I do, which I have and do you know what, it’s amazing! It’s friends like Hannah that inspire me & give me my energy! The punch bag will always win!